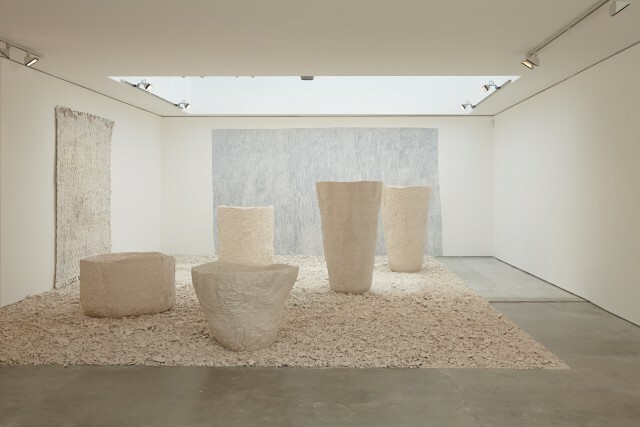 Among the artist’s new works currently on view at London’s Edel Assanti, is a large, landscape-like installation composed of large-scale, hand-carved plaster urns set upon a bed of the plaster chips left behind in the process. Assembled only recently, this work recalls the ancient Plain of Jars, a site in Laos sprinkled with freestanding megalithic jars. Such resonances, between the present and the past, the human-scale and the monumental, run through this exhibition and each one of Carey’s evocative pieces. The urns, with their textured surfaces of interwoven lines, sit surrounded by a group of wall hangings. To make these expansive works, Carey dipped strips of dyed canvas into plaster and before it set, she wove them together. She then went back over their rippling surfaces with pencils, interrupting their largely off-white coloring with patches of shading. These hangings call to mind the craft and culture of quiltmaking in their assembly from an assortment of individual fabric pieces into a unified whole. Also on view is a much more ephemeral work: a site-specific wall drawing made with colored pencils. From afar, the drawing appears as a soft, smoky rectangle centered upon the gallery’s far wall. Up close, its composition of individual darker and lighter square patches reveals itself, echoing both the patterned weave of the wall hangings and the lined surfaces of the urns. The delicacy of the drawing highlights that of the other works nearby. Though they seem, at first, to be solid and substantial, they can easily crumble into pieces and be brushed away. Just like so much of the stuff of the past, and the people who made it.